Wearing contact lenses increases the risk of fungal eye infections, especially if the recommended hygiene regimes are not upheld. 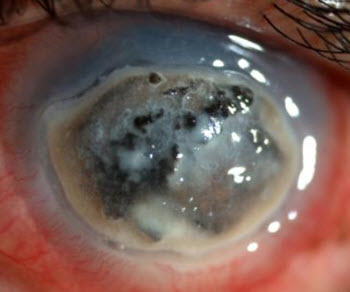 The cornea is the most common site for fungal eye infections, but other parts of the eye and its surroundings can be infected as well, including the sclera (white of the eye) and the eyelid. Keratitis – which means inflammation of the cornea – can be caused by many different patogens, including bacteria, virus, amoebas, parasitic worms, and fungi. When it is caused by fungi, it is called fungal keratitis. The cornea is the transparent dome that covers the iris, the pupil and the anterior chamber of the eye. A majority of patients treated for fungal keratitis developed the infection after experiencing eye trauma, particularly trauma involving a plant, e.g. getting a thorn in the eye. Other known risk factors for fungal keratitis are underlying eye disease, weak immune system, and contact lens use. Fungi from the genera Aspergillus and Candida are common culprits in cases of fungal keratitis. In 2006, there was an outbreak of fungal keratitis caused by fungi from the genera Fusarium. This outbreak was associated with certain contact lens solutions manufactured by Bausch & Lomb. The company voluntarily withdraw these products from the worldwide market in May, 2006. If you suspect that you have fungal keratitis, seek medical attention. 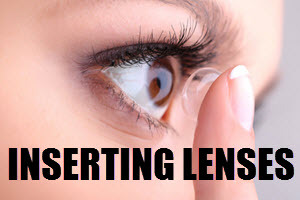 If you are wearing contact lenses, remove them immediately and do not replace them with new contact lenses. If the eye doctor is not sure about what is causing the keratitis, a tiny scraping from the cornea can be sent to a laboratory for analysis. Fungal keratitis is treated with anti-fungal medicine administered into the eye and/or orally administered anti-fungal medicine. The first choice of medical treatment for filamentous fungal keratitis is usually topical natamycin. If the cornea is instead infected with yest fungi (such as candida-fungi) the eye doctor is more likely to prescribe topical amphotericin B. Some patients need to be treated with anti-fungal medicine for several months to get rid of the fungal keratitis. In some cases, medical treatment isn’t enough and the patient will need surgery too. Corneal transplantation can be necessary to restore the eye. 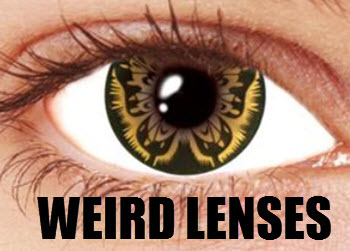 A lens case with growing fungi inside will serve as a reservoir for fungi that can infect the eye. 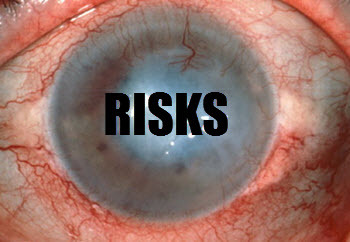 One way of eliminating this risk is to use single-use contact lenses instead of multi-use ones. In the study “Acanthamoeba, bacterial, and fungal contamination of contact lens storage cases”, published by Gray TB et al in 1995, 101 contact lens cases were checked. All of them belonged to contact lens wearers that had no symptoms of eye infection.